The Trends in International Mathematics and Science Study (TIMSS) is an international assessment conducted under the auspices of the International Association for the Evaluation of Educational Achievement (IEA), and it targets mathematics and science knowledge of students in Grades 4 and 8 (Grade 8 is Secondary Two in Quebec). TIMSS was first administered in 1995 and has been carried out every four years since then. It provides education policy-makers, administrators, teachers, and researchers with powerful insights into how education systems are functioning as well as critical intelligence about the possibilities for education reform and improvement. A cognitive dimension specifying the domains or thinking processes expected of students as they engage with the mathematics and science content. The content domains and topic areas of the assessments are different for Grade 4 and Grade 8, but the cognitive domains are the same for both grades, encompassing a range of cognitive processes involved in solving problems throughout the primary and middle-school years. The assessment takes about 70 minutes to complete at the Grade 4 level and 90 minutes at the Grade 8 level. An additional 30 minutes are required for students to complete a contextual questionnaire intended to collect information on students' characteristics and attitudes toward learning. 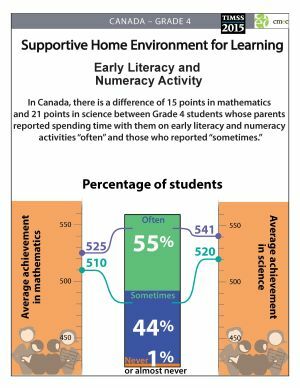 Parents or guardians of participating Grade 4 students are asked to complete a questionnaire on home contexts, while teachers provide valuable information on the classroom environment in which mathematics and science are taught. School principals answer questions about student demographic characteristics, the availability of resources, types of programs, and environments for learning in their schools. Canada took part in TIMSS 1995 and TIMSS 1999. In 2003, only Ontario and Quebec participated (as benchmarking participants), while in 2007, they were joined by Alberta (at the Grade 4 level only) and British Columbia. 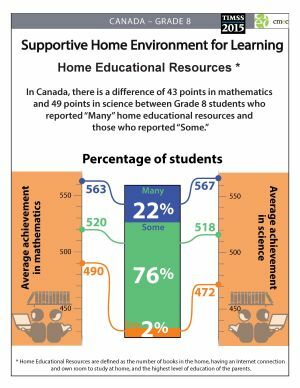 In 2011, Alberta, Ontario, and Quebec participated as benchmarking participants at both the Grade 4 and Grade 8 levels. Five Canadian provinces participated in TIMSS 2015: Alberta (Grade 4 only); Ontario and Quebec (as benchmarking participants); and Manitoba and Newfoundland and Labrador (as part of the Canadian sample).